This topic describes how to configure warehousing for cloud deployments. If you are looking for how to configure warehousing for on-premises deployments, please see Warehousing for on-premises deployments. This topic describes how to install and configure Microsoft Dynamics 365 for Finance and Operations - Warehousing. Finance and Operations - Warehousing is an application available on Google Play Store and Windows Store. For the current version of Finance and Operations, this app is provided as a standalone component, which means self-deployment on devices used for warehouse tasks. In order to use the app in your Finance and Operations environment, you must download the app on each device and configure it to connect to your Finance and Operations environment. This topic describes how to install the app on your devices. It also explains how to configure the app to connect to your Finance and Operations environment. The app is available on Android and Windows operating systems. To use this app, you must have one of the following supported operating systems installed on your devices. You must also have one of the following supported versions of Finance and Operations. Use the information in the following table to evaluate if your hardware and software environment is ready to support the installation. The Zebra App Gallery has been retired, which means that the Finance and Operations - Warehousing app will no longer be available for download from that location. In a web browser, go to https://portal.azure.com. Enter the name and password for the user who has access to the Azure subscription. 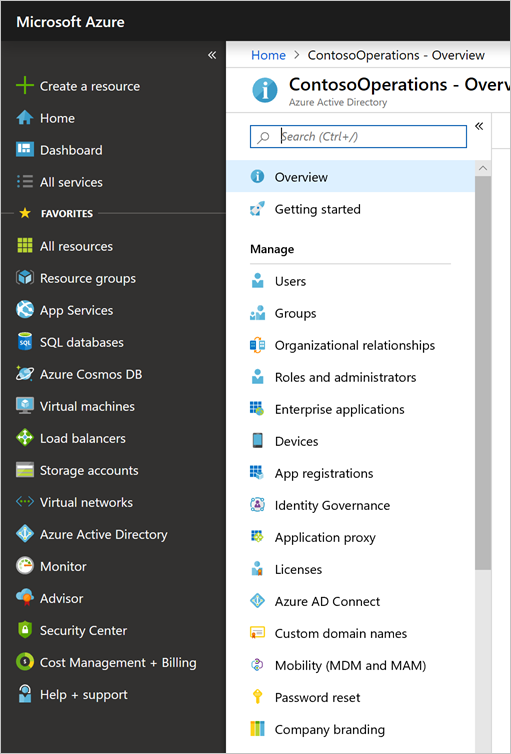 In Azure Portal, in the left navigation pane, click Azure Active Directory. Ensure that the Active Directory instance is the one that is used by Finance and Operations. In the list, click App registrations. In the top pane, click New application registration. The Add application wizard starts. Enter a name for the application and select Web application/web API. Enter the sign-on URL, which is your web app URL. This URL is the same as your deployment URL, but oauth is added to the end. Click Create. Select the new app in the list. Remember the Application ID, you will need it later. The Application ID will later be referred to as the Client ID. Click Keys in the Settings pane. Create a key by entering a key description and a duration in the Passwords section. Click Save and copy the key. This key will later be referred to as the Client secret. 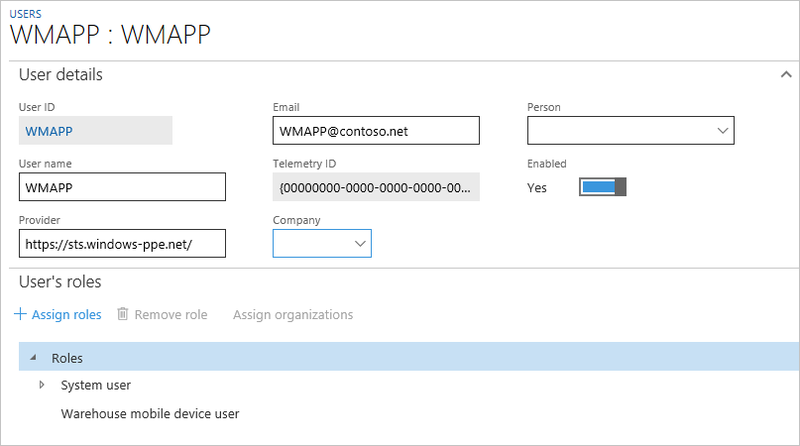 Create a Finance and Operations user that corresponds to the warehousing app user credentials. In Finance and Operations, go to System administration > Common > Users. 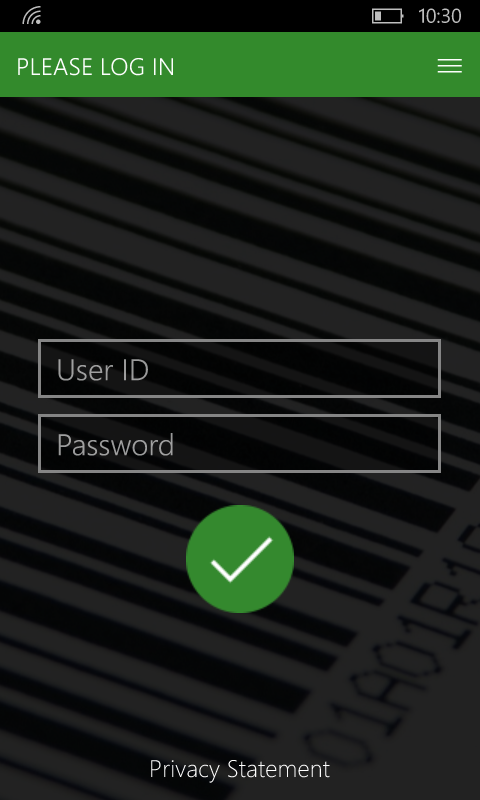 Assign the Warehouse mobile device user, as shown in the following screenshot. 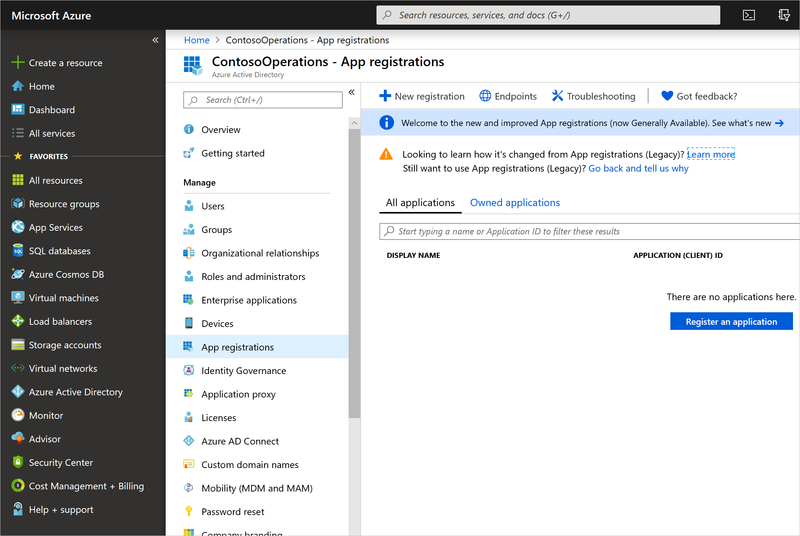 Associate your Azure Active Directory application with the warehousing app user. Enter the Client ID (obtained in the last section), give it a name, and select the previously created user. We recommend that you tag all your devices so that you can easily remove their access to Finance and Operations from this page in case they are lost. 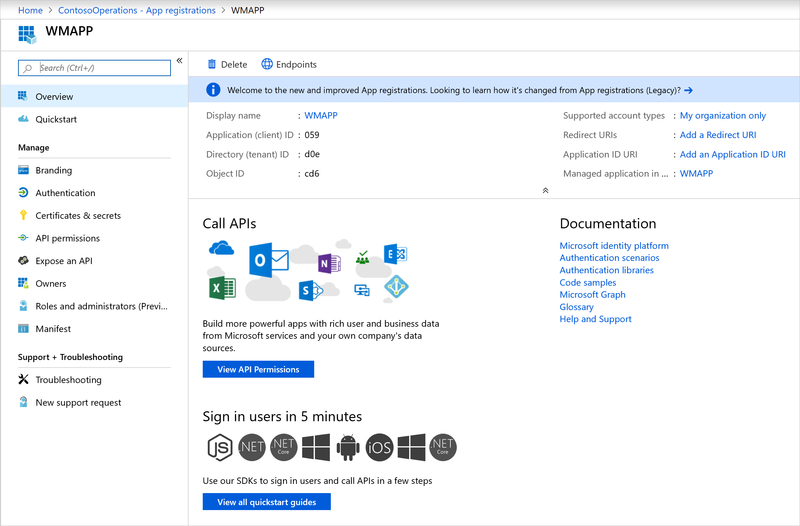 You must configure the app on the device to connect to the Finance and Operations server through the Azure AD application. To do this, complete the following steps. In the app, go to Connection settings. Clear the Demo mode field. 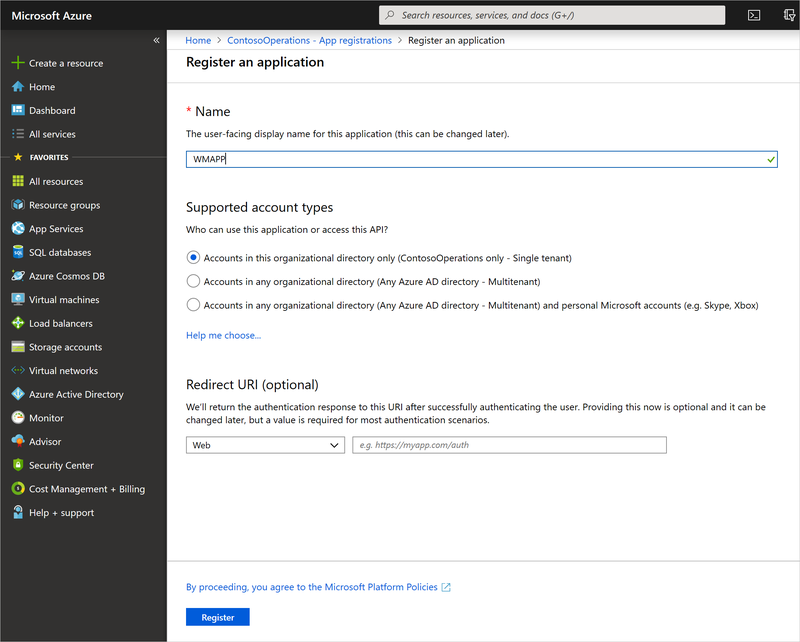 Azure Active directory client ID - The client ID is obtained in step 9 in "Create a web service application in Active Directory". Azure Active directory client secret - The client secret is obtained in step 11 in "Create a web service application in Active Directory". 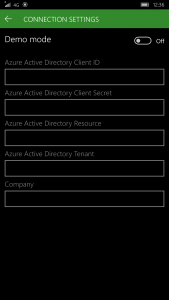 Azure Active directory resource - The Azure AD directory resource depicts the Finance and Operations root URL. Note: Do not end this field with a forward slash character (/). 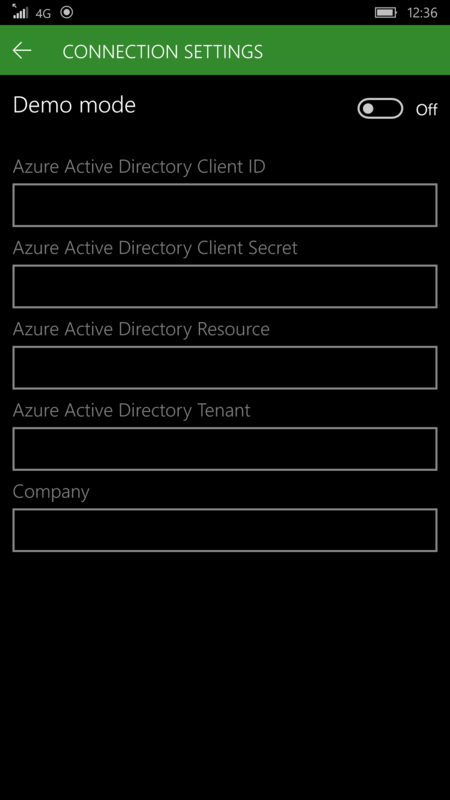 Azure Active directory tenant - The Azure AD directory tenant used with the Finance and Operations server: https://login.windows.net/your-AD-tenant-ID. 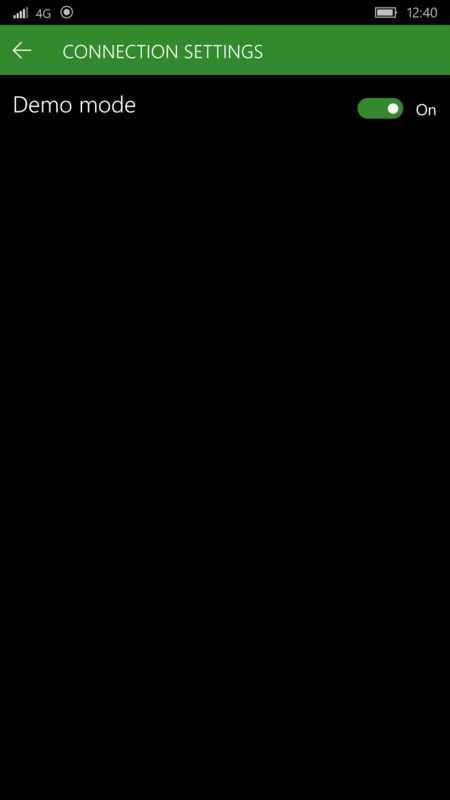 For example: https://login.windows.net/contosooperations.onmicrosoft.com. Note: Do not end this field with a forward slash character (/). Company - Enter the legal entity in Finance and Operations to which you want the application to connect. Select the Back button in the top-left corner of the application. The application will now connect to your Finance and Operations server and the log-in screen for the warehouse worker will display. In case of a lost or compromised device, you must remove access to Finance and Operations for the device. 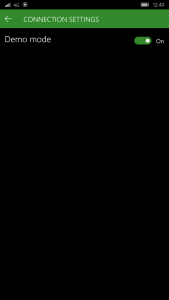 The following steps describe the recommended process to remove access. Delete the line that corresponds to the device to which you want to remove access. Remember the Client ID used for the removed device, you will need it later. Click the Active Directory icon on the left menu, and ensure that you are in the correct directory. In the list, click App registrations, and then click the application that you want to configure. The Settings page will appear with configuration information. Ensure that the Client ID of the application is the same as in step 2 in this section. Click the Delete button in the top pane.